I was talking to my husband over the weekend and we decided that we are going to do our best to “simplify” this year . . . we probably won’t be sending out Christmas cards, our schedules are going to revolve around spending time with family, and our Elf on the Shelf probably won’t be making his grand appearance. I just really want to keep the focus on our family and the spirit of the season. One thing that won’t be any different is baking in the kitchen . 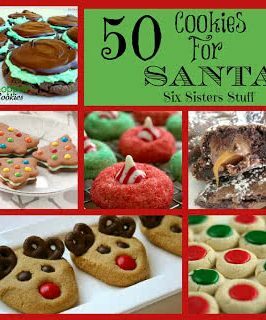 . . some of my best holiday memories revolve around being with my mom and sisters in the kitchen and I want the same thing for my kids! 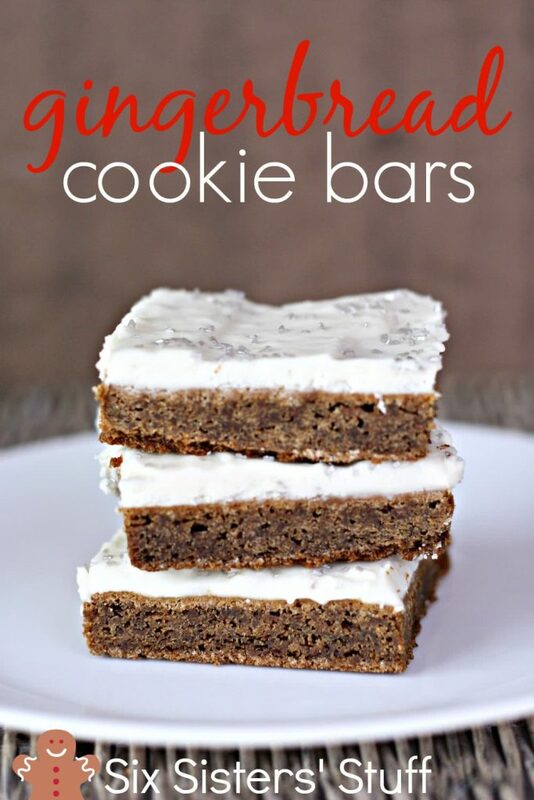 However, these gingerbread cookie bars definitely simplify the cookie-making process! Instead of having to cut out tons of gingerbread men, you get all the delicious gingerbread flavor in an easy-to-make bar cookie. They are chewy and soft and packed full of holiday flavor. Plus, they are easy enough that your kids can help you make them! 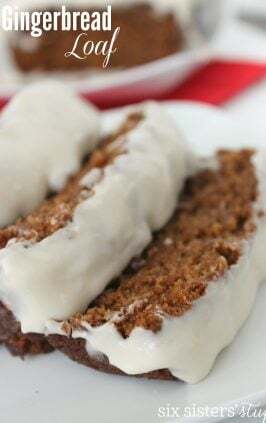 These bars can be topped with a dusting of powdered sugar or our favorite cream cheese frosting! Spray a 9x13-inch baking pan with nonstick cooking spray and set aside. In a large bowl, combine butter, sugar, brown sugar, vanilla, and molasses and beat until creamy. Add the egg and stir until completely incorporated. Add the rest of the ingredients and mix until well combined. Press dough into pan (I just used my fingers to press the dough to the edges of the pan). Bake for 15-20 minutes and let cool (don't over cook- I cooked mine for exactly 15 and they turned out perfect). When finished, you can frost them with cream cheese frosting or even cover with a light dusting of powdered sugar. Or, don't top them with anything. They are delicious no matter what you do! How yummy! I sure wish I could hunt down molasses here in Costa Rica. I just love holiday baking and nothing reminds me more that I'm not in my midwestern hometown than Christmastime cookies with no peppermint chips or gingerbread. Mmm! Pinned this recipe. Thanks, ladies. OH HOLY YUM!! Cannot wait to try these! They look absolutely delicious!! These look delicious - and easy! 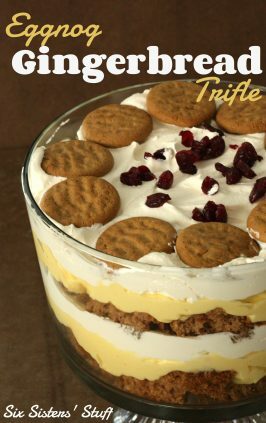 I am going to make a gluten free version - has anyone tried to adapt this recipe yet? 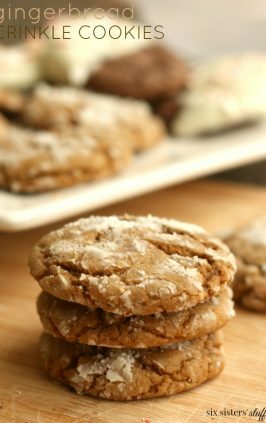 I love gingerbread - but afraid cookies will be too crumbly and difficult to work with - this looks like the perfect solution! Thank you! Do you think you could double this recipe to make them cookie-sheet size? We have only made them in a 9x13, so I don't want to say it will work just fine. But really I don't see why it wouldn't work. Watch them closely and it may require a little more cooking time. Let us know how it all turns out! I was bummed when mine came out way undercooked after baking 20 min. The sides were done but not the inside. This happens when I make brownies also. I blame it on the high altitude in utah. What can I do differently? Another comment said she needed to cook it longer than 20 minutes. I made these on Thursday. They were so good that I'm making more on Sunday. I had to cook them longer than 20 minutes to cook them fully. They still came out perfect, crunchy edges, which I like, and a gooey middle. The spices and molasses had a great balance and made the house smell festive. Thank you. 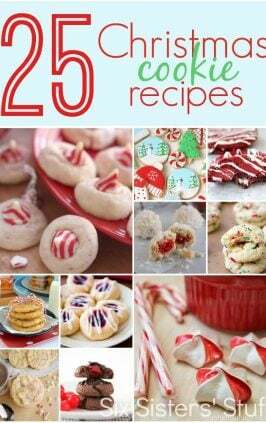 I am wanting to make these ahead of time(5 days) for a cookie exchange. i was going to freeze them, do you think that will work and should i frost them before I freeze them, or wait until they thaw to frost? They will freeze well with the icing on or off. These turned out perfect and delicious!! Will make them time and time again! Do you know if I can make these cutouts instead of bars? 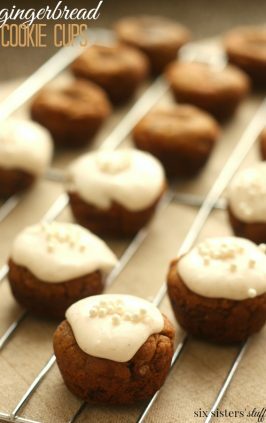 They taste amazing and I want to make gingerbread men using this recipe if it will work. Cut outs would be super cute! I think it would work! I put parchment paper in the pan. Helped them cut so nicely. I baked mine for 20 minutes and they are the consistency of brownies. PERFECT. Will definitely make this recipe again. Yum. Omg... Saw the recipe and had to make them. Thank goodness I froze 3/4 of the pan to take out later this month. To die for! Made these last night and they are all gone! These are amazing!..just sayin. I made these bars with the frosting a few times. There is a bakery that is now closed but they had a ginger cookie that my husband loved. These bars remind him of those cookies so he loved these bars a lot.